Happy May birding to everyone. As you can imagine, it’s been quite busy here with field work. Still, we are well overdue for an update. 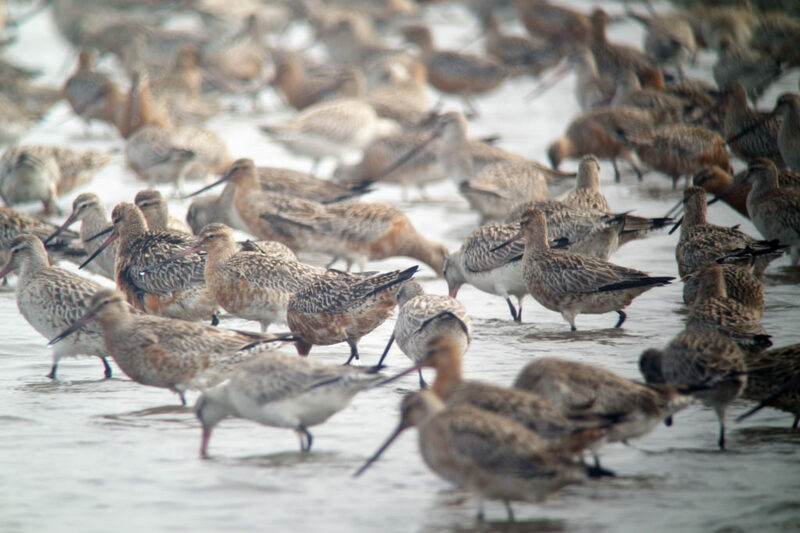 Here at Yalu Jiang, we have already seen peaks in number of Great Knot and Bar-tailed Godwit. And many godwits (mostly baueri) appear to have already departed, while many Great Knot have apparently decided to go somewhere else in the last week or so. Most of our birds seemed to have been feeding well this season, despite some challenges, but we won’t really know more of the story until after the data are analyzed. That news will come in a much later blog post. With this update, I would like to introduce some more about our field work. 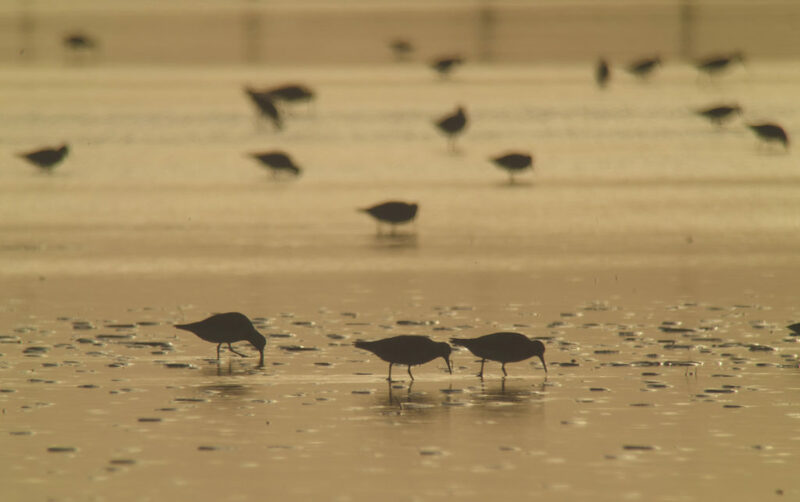 Many might be wondering what we actually do – what shorebird research here entails. Well, we have a small team of six. 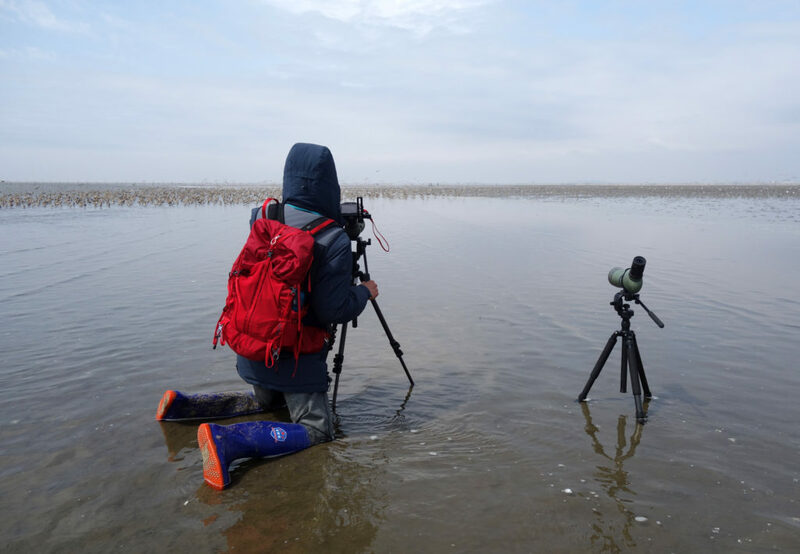 Some of us have shorebird experience, while others have just come for the fun, to volunteer and learn more about the adventures of conservation and ecology on a Yellow Sea tidal flat. Trust me, it is adventurous. We work according to the tides and weather, and not much can really stop us from going out except for maybe strong rain or heavy fog. So what exactly is the work? Well, a few of us focus on recording foraging videos, which is my favorite task. I love watching birds feeding and interacting with each other. There are so many questions that arise. 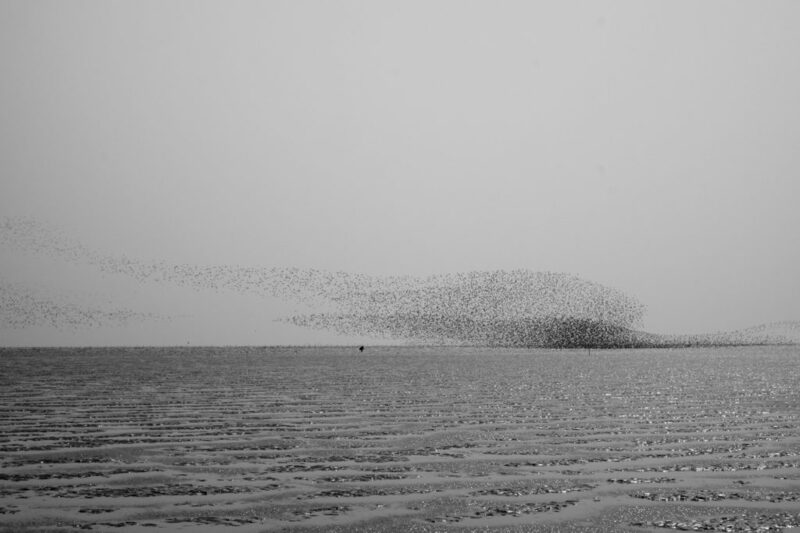 And because individual shorebirds tend to have so much personality, there can sometimes even be real drama. It’s easy to imagine the challenges they are facing on a daily basis, just to survive. And they are beautiful too of course. In addition, there are so many benthic species to discover and learn about on a tidal flat. I find this kind of fieldwork much better than television; and it’s in real-life high definition. Every day is like a new episode of BBC’s Planet Earth minus Attenborough’s narration. 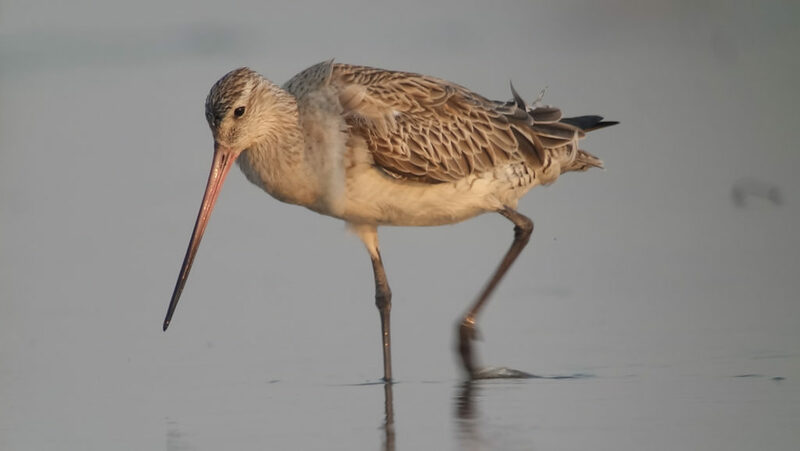 Bar-tailed Godwit Limosa lapponica feeding on the outgoing tide © Jason Loghry. Can you spot a flag? After recording sufficient videos and collecting droppings (yes, we collect quite a few droppings) at a particular foraging site, we then try to follow up by sampling the same area for bivalves, gastropods, crustaceans, and polychaetes, which are the main food source for the shorebird species we are focusing on. This can also be interesting because you never know how many animals (i.e. how much food) there is going to be in the tidal flat, or what kind of fascinating bristle worm or other benthic species might turn up in your sieve. Mactra veneriformis © Jason Loghry. 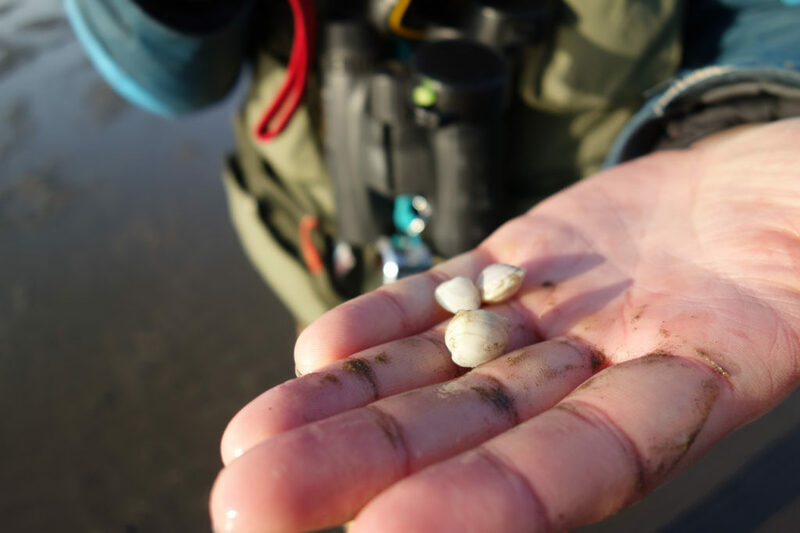 Although “planted” by local fishers for harvesting later in the season, this was one of this spring’s most abundant bivalves, and a favorite of both locals and refueling shorebirds. 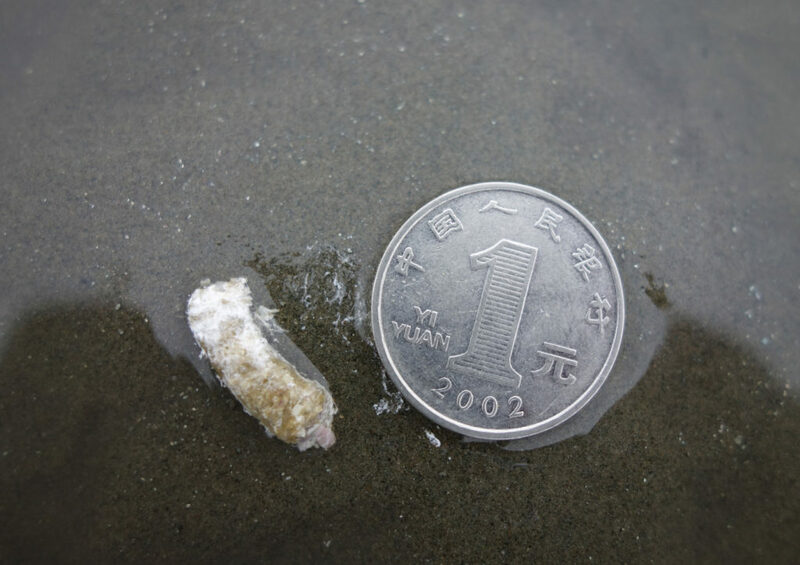 Many droppings can be recognized by their size and shape © Jason Loghry. Can you guess which species this belongs to? Another task we have is to map the distribution of shorebird species across different sites of the reserve. Each day, the bird mapper visits a different site, counts the number of birds by species, and records details of their whereabouts. This is done in coordination with core sampling, in order to better understand the relationship between these species and the food over time. This is also a good chance for us to spot color-ringed or flagged birds from across the flyway. It’s always important for us to record and share these records. You can report your Korean flag sightings to us at sightings@birdskorea.org. 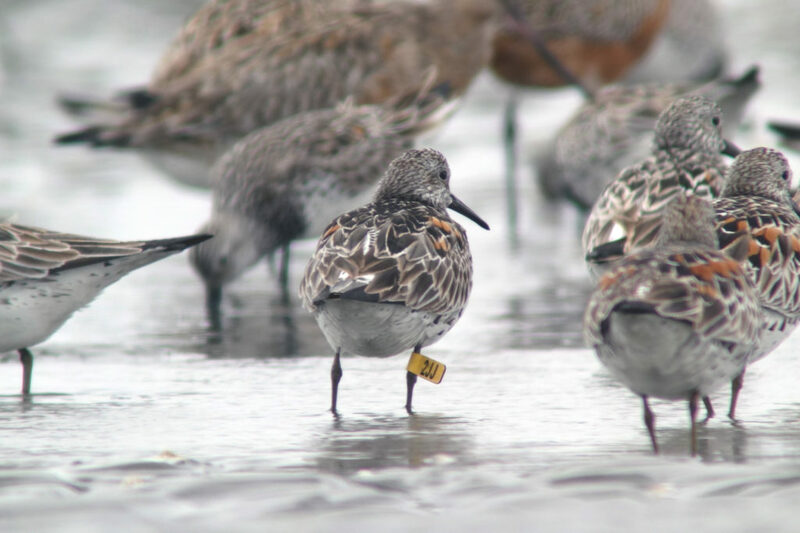 Great Knot with Yellow ELF (engraved-leg-flag) © Jason Loghry. Find out where it’s from, here. We also carry on the tradition of grid core sampling during the spring tides. The first such research was done at the reserve by David Melville in April of 2008, then by Jimmy Choi, followed by Peng Hebo, and now even more extensively by our team leader, Zhang Shoudong. He is a tireless benthic sampler. I don’t know if I’ve ever known anyone more driven than Shoudong. It’s been great to work with him again. In fact our entire team has been great to work with. And we all feel honored to be joined by David Melville, who has just returned from a shorebird survey in the DPRK (looking forward to reading about it in the upcoming September issue of Stilt). He has been a regular visitor to Yalu Jiang now for several years, and is one of our flyway’s lead conservationists and shorebird experts. Finally, every night we work as a team and process the daily samples together and fill in our data for the day. After a long day in the field, especially on days when weather conditions are noticeably harsh, this can be pretty demanding. But as a team, we support each other, keep a good sense of humor (which is essential! ), watch the clock, and get ready for the next day: another day of researching and enjoying wonderful shorebirds at one of the most important stopover sites in the world. I quite often think about what it would be like to be able to do this kind of research in the ROK. I wonder what the stopover sites are like this season in the ROK. 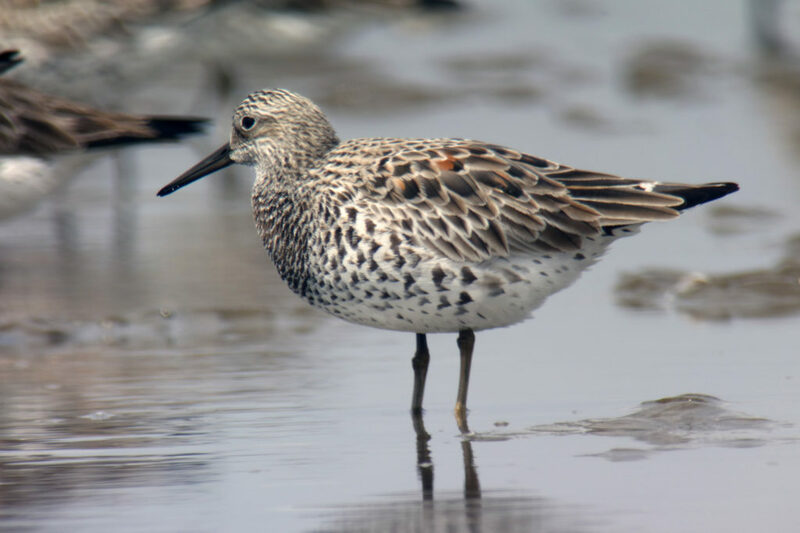 What kinds of numbers of shorebirds are migrating through? 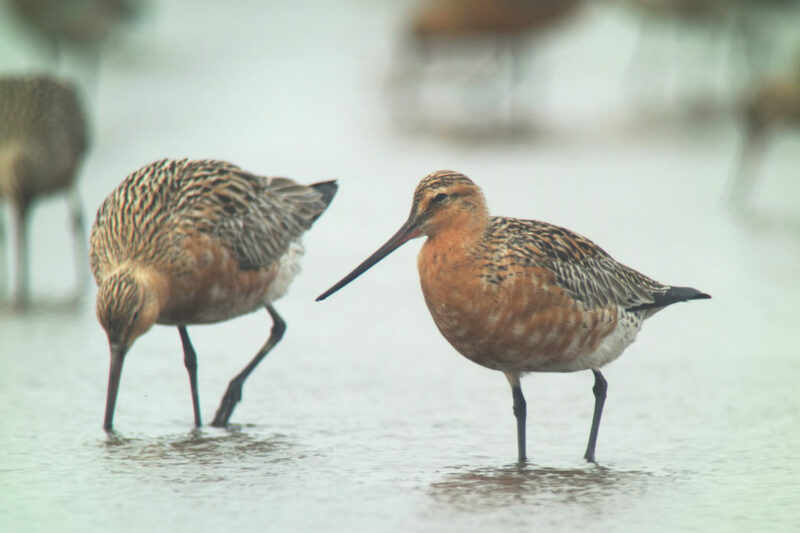 With so few tidal flats remaining in the Yellow Sea, are shorebirds able to find enough food to make their way to the breeding grounds successfully? How about in Korea? I’m very much looking forward to the day when we will be able to conduct this kind of research in Korea too, sharing information with others in the Yellow Sea Ecoregion and all along the Flyway. Let us all hope that day comes soon!